Founding assembly of the Sindicato Democrático de Estudiantes at the Convent of the Capuchin Fathers of Sarriá, March 1966. Photo: Guillem Martínez Molinos. 1968 is a prominent year in the popular history of the twentieth century. To think about it in relation to the Spanish State implies both analyzing the "global 1968" and situating the events of that year in Spain in the broader context of the rise of the anti-Francoist movement. It can be stated, as Kristin Ross has, that there was no Spanish 68. 1 But this must be interpreted in the sense that there was no exceptional May Event. Not in the sense that nothing happened, but rather that 1968 must be considered within a general dynamic of rising social protest. Not a May explosion, but a turbulent 1967-68 period that was part of the rise of the student movement that had been building since 1964–1965, the emergence of a new workers’ movement around the Comisiones Obreras (Workers' Commissions) since 1962, and the growth of the Spanish Communist Party (PCE) and the revolutionary left. The lack of a "May 68" event, in May or at any other moment of that year, means that international analyses of 68 rarely view Spain as a particularly outstanding case. 2 But if we put the focus not on the year but on the period, there is no doubt that the anti-Franco struggle was one of the great movements of the time and that international 68 events influenced it. Understanding the Spanish 68 requires an understanding of the rise of anti-Francoism in the previous years and its subsequent evolution after the state of exception of January 1969. The first distortion is to deny the political effervescence of Spain at the time. That is, to take advantage of the lack of a "May 1968 event" in Spain to dissolve the importance of anti-Francoism, banalize it, and render it a secondary issue in a society benefiting from liberalization and developmentalism. To deny the scope of the revolt is, in any case, a common mechanism of conservative historiography and views of the sixties in general. The third is to isolate anti-Francoism from its international context. An "autarkic" conception of anti-Francoism serves again to limit its scope and content and reduce it to merely a struggle for democracy, ignoring its more or less diffuse semi-socialist and anti-capitalist character, in phase with the rebellious wave of the time. 8 Although it responded to the specific social and political situation of the Spanish State, the movement must be placed in its international, political, social, and cultural context. Although the events of 1968 took place in specific national contexts, and lacked coordination and direct links, despite some informal ties between activists, 1968 as such presents the characteristics of a global event. 9 The Spanish 68 must be analyzed from this perspective. This does not mean blurring its particularities and considering them a mere local expression of a global dynamic, but better understanding its characteristics. The national and the international are interrelated and can neither be dissolved into one another nor rigidly dissociated. The struggle against the Sindicato Español Universitario (SEU — Spanish University Union) and to achieve democratic student representation constituted the strategic axis of the 65–68 period. 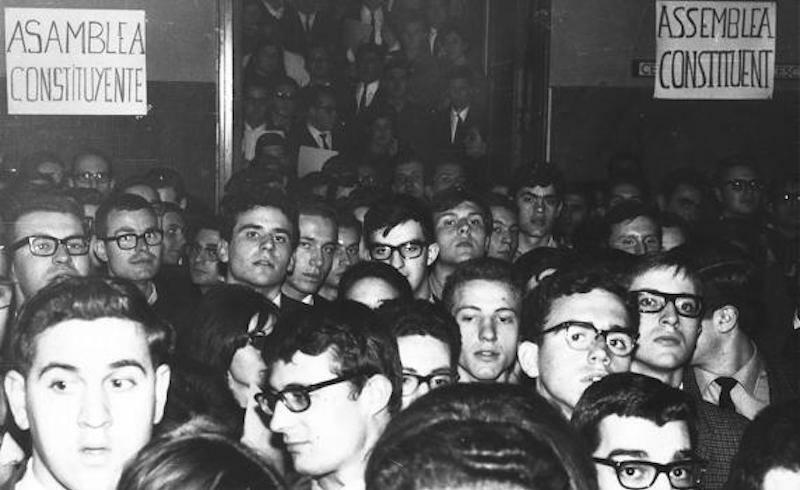 In the first national student meeting held in Barcelona in March 1965, it was agreed to promote autonomous democratic student structures in confrontation with the SEU. This culminated in March 1966 with the creation of the Sindicato Democrático de Estudiantes (SDE — Democratic Student Union) at the University of Barcelona at an assembly held at the Convent of the Capuchin Fathers of Sarriá, whose protection of the students before the police siege caused major impact. It has since then been said that, for the Barcelona student movement, "our 68 was 66," although this should be understood in the sense that it was the decisive moment for the emergence of the student protests, nor in the sense that what happened that year was equivalent to the global significance of the events of 1968 in France. 20 The foundation of the SDE in Barcelona would serve as a model for the creation of many other SDEs in 67 and 68, among these the SDE at the University of Madrid launched on April 26, 1967. The rise of the movement since 1965 was causing a shift in the correlation of forces between the protest movement and the Francoist institutions, creating a situation of "dual power" within the university. 21 However, once the old union had been destroyed and democratic representation was imposed through the SDE, paradoxically, the student union lost its meaning. Its limitations as an instrument of global social change became apparent. That is to say, the achievement of a democratic union was more important than the role that it could then actually play. The imposition of democratic student representation was an unquestionable victory, but its functionality and real usefulness for the struggle was less relevant. The SDEs slumped into crisis, at different rates, after 1968. Hence the paradox of a successful failure. The events of May 68 in France impacted the Spanish State, although the year itself did not feature any extraordinary episodes of mobilization. Throughout the crisis of the French May the Francoist authorities showed major concern that it could spread to Spain. The fear of "contagion" guided their entire policy. They tried, at first, to avoid coverage of the events. Censorship worked well and strictly on radio and TV, but the written press after the enactment of the Press Law in 1966 had more room. Preparing for the next time, the conviction that there would be another occasion was the lesson that was learned from May 1968 by those who most identified with the French crisis, the FLP students. This allowed them to get over the defeat and continue on the road. But, as Miguel Romero points out, "it took a long time to learn that May 68 was not the 'model' for the future crises of capitalist society and to learn to build a revolutionary organization in conditions of stagnation or regression of social mobilization, not merely by waiting for the great event, but within the real struggles and movements." 32 Be prepared for the decisive moments and know how to manage the transitory "non-moments." To resist in difficult times and not to miss opportunities when they come. Combine the sense of urgency with patience. Lessons that, half a century after May, allow us to keep the torch of revolutionary hopes alight in the present. 9. Fink, C., Gassert, Ph., and Junker, D. "Introduction" in Fink, C., Gassert, Ph., and Junker, D. (eds). 1968. The World Transformed. Cambridge: Cambridge University Press, pp. 1-27. This emphasis on the global dimension of the event seems to me more successful than the other way around, as Richard Vinen tends to do in 1968: the year in which the world could change. Barcelona: Critica, 2018. 11. Pastor, J. (2008) "El movimiento estudiantil bajo la dictadura franquista y el 68 español" in Garí, M., Pastor, J., and Romero, M. (eds.). 1968. El mundo pudo cambiar de base. Madrid: La Catarata, p.284; also González Férriz (1968.El nacimiento de un nuevo mundo. Barcelona: Debate, 2018) inserts the protests of the Spanish State in their global context. 23. Fleites, A. (2009) "¿Retirarse a tiempo? La visión de mayo del 68 en la España contemporánea", Historia Actual Online, 19, pp. 163-176. 26. Romero, M. (2008). "Mayo del 68 desde lejos: un ensayo impaciente" in Garí, M., Pastor, J., and Romero, M. (eds.). 1968. El mundo pudo cambiar de base. Madrid: La Catarata. 32. Romero, M. (2008).op.cit., p.323. Josep Maria Antentas is a Teacher of Sociology at the Universitat Autònoma de Barcelona (UAB).